The TORRINGTON LIVESTOCK COMMISSION CO. was built in 1934 by the Petsch family from SCOTTSBLUFF, NE. Mac Swanson purchased it in the early 1940s, then sold it to L.W. Maxfield in 1949. Through the years, Maxfield did extensive remodeling to increase the capacity of the building and yards. In the mid to late 1960s, the installation of a ring scale helped to increase the speed and efficiency of this market. Maxfield continued to build on this business for 35 years, making this the largest auction in Wyoming and ranking third to fifth largest auction in the nation. Drawing cattle from a nine-state region: Nebraska, Colorado, Arizona, Nevada, Utah, Idaho, South Dakota, Montana and the bulk of Wyoming, Torrington Livestock attracts buyers from all over the nation. In the late 1970s, L.W. Maxfield sold the yards to two of his sons, Mike and Lester Jr. and to Oliver Dicken, who was auctioneer and worked for L.W. for many years. In 1988 Mike and Oliver bought out Lester Jr’s. share of Torrington Livestock Commission Co. In 1989, Mike and Oliver sold half interest to Shawn and Lex Madden, who were leasing and operating Stockman Livestock south of Torrington. These four partners then purchased Stockman Livestock, completing the merger of the two sale barn companies, and forming "Torrington Livestock Markets, Inc."
In 1998 Lex Madden won the title of "World Champion Auctioneer" and in 2001 Shawn Madden won the title, as well. In April of 1999, Mike Maxfield retired from the company. In 1999 Torrington Livestock Markets marketed enough cattle to become the Nation's Largest Independent Livestock Market. In April of 2002, Oliver Dicken passed away leaving Shawn and Lex Madden as partners. Torrington Livestock Markets LLC., employs approximately 35 full-time and 60 to 70 part-time sale barn personnel. The company also employs approximately 20 "field representatives" who work with customers throughout the region. During the fall, Torrington Livestock Markets operates both sale barn facilities, offering two and three sales and selling up to 19,000 head per week. The "north barn", Torrington Livestock Commission Co., is operated year round selling all classes of livestock every Friday during the year. Wednesday load lot sales for yearlings and calves is held every Wednesday September through April. The fall run is started with the Annual Labor Day Special Calf and Yearling Sale. The "south barn", Stockman Livestock Auction, was operated seasonally. Special calf, bred cow and pair sales were held there. As of April 2009 the McClun Bull Sale was the last cattle sale held. Facility is now used for Madden Bros Consignment Sales. 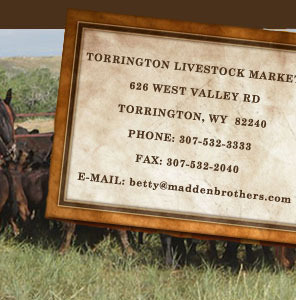 Torrington Livestock Markets is a full-service company offering any type of marketing service for the livestock owner. These services include a sale barn, a bonded country cattle dealer company, called Torrington Livestock Cattle Co and marketing cattle through video sales with Cattle Country Video.